Your home kitchen can attract numerous different types of germs and bacteria, and you should always try to keep it looking nice and clean to ensure that these germs and bacteria won't grow and colonize. Nearly every surface area in your kitchen can harbor nasty bacteria that can become unhealthy to your home environment and they can be especially bad if they are around areas where your edible foods are. And so it becomes essential that you try to maintain a daily or weekly cleaning schedule to keep these germs and bacteria at bay and to help you keep your kitchen looking nice and clean. Below are some of the necessary things that you should try to incorporate into your daily cleaning tasks to help you better sanitize and clean your kitchen. The most common area in your kitchen where you'll find bacterial life would be your kitchen counter tops. The kitchen counter top gives germs plenty of surface area to dwell in. 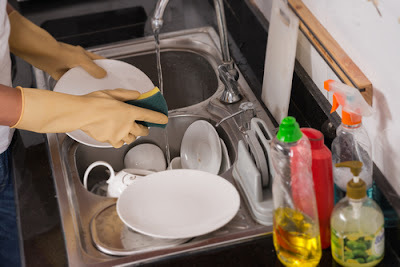 Because you'll be laying your foods on your kitchen counter top most of the time, it becomes essential to maintain a clean counter top surface to avoid any food contamination. There are several varieties of kitchen cleaning spray that have bleach compounds mixed into it, and these are by far the best to use for your kitchen counter tops. Additionally, you) could also wipe down your counter top with hot water to clean off the surface of any remaining residue. For this to work efficiently, you'll have to make sure that the water stays hot when you're wiping down the counter top with it. Your kitchen cleaning routine should always include moping as this not only helps to keep your feet and socks clean when you're moving around the kitchen, but it'll also contribute to eliminate any potential microorganism and other bacteria that might be dwelling in the crevices of the kitchen flooring. It is advisable for you to use floor moping detergent with hot water since this combination works best to not only kill off any tiny living bacteria on the floor but also helps to loosen up any stuck dirt. To get the moping done much quicker, you can invest in a steam powered mop. These are versatile and can work on virtually any type of kitchen flooring. The kitchen cabinet is the next thing on our list of tasks that you should try to include into your cleaning regime. Make sure that you wipe down the exterior of the cabinets and if there is space above your cabinets be sure to wipe that down good too. Dirt and dust can collect and build in these areas so make sure that you don't overlook them. Try using a kitchen cabinet cleaning sprayer as they will help restore the shine in the cabinets and also contributes to making them last longer. Lastly, you have to make sure that you clean your kitchen appliances thoroughly. 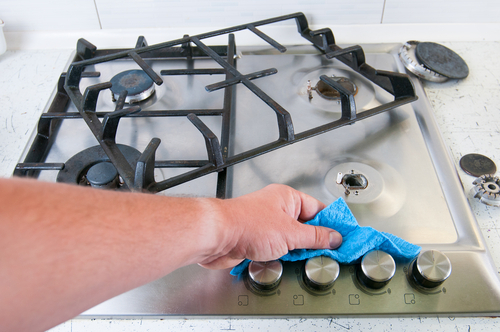 Try using a de-grease for areas where there is oil and grease residue. Some oven may have baked on grease that has been there for a long time and might be hard to scrape off. Allow your oven to cool down for about 15 minutes afterward and then wipe out any grease and oil inside. They should be much easier to wipe down at this point. The dishes can be the worst problem in the kitchen. The best way to keep dishes from taking over the sink, the counters, and the kitchen table is to clean them up as you use them. Train your family -- and yourself to always put dirty dishes straight into the dishwasher. Clean the dishes and put them away and then enjoy your evening without guilt. The floor is another area of the kitchen that gets out of control quickly. A daily sweep is usually enough to keep the floor looking great and only takes about five minutes. Mop about once a week, adding it to your calendar if that helps. Another great trick for keeping the floor clean is to place a couple of area rugs by the sink and the stove. When the inevitable spills occur, just toss the rug in the laundry or shake it out in the back yard. You can give your whole kitchen a complete makeover just by replacing your cabinet doors, especially if they are old or stained. Give your existing cabinets a little love by cleaning out all the items you never use and donating them to your local thrift store. While yogi are at it, throw away any expired food you have hanging around. Organize your remaining items in a logical manner and show your family so that they know where to put things. Possibly -despite everything you like the look of your cabinets, however their only somewhat grungy. 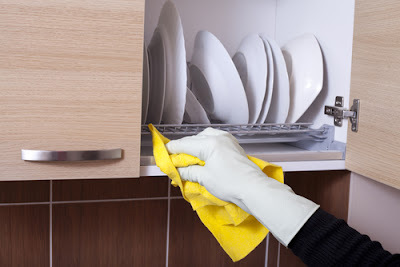 On the off chance that your cabinets are made of strong wood and need somewhat more cleaning than simply cleanser and water, at that point there is another approach you can attempt. It's more of an acidic approach, however, will carry out the occupation when something somewhat harder is required. You'll require a blend of tablespoons turpentine, three tablespoons bubbled linseed oil, and 1 quart of bubbling water. You must be exceptionally cautious with this formula, as it is a to some degree combustible blend. Any brushes or clothes that interact with this stuff will be fairly combustible too. Make certain to discard them per your neighborhood city mandates. Once you have your little blend prepared, it's an ideal opportunity to get the chance to work. Either cover or expel anything around the cabinets that you don't anticipate cleaning. This incorporates cabinet equipment ledges, floors, dividers, and little machines. If you can purge the cabinets however much as could reasonably be expected, it will encourage cleaning inside and additionally out. Make sure to wear gloves while doing this occupation, as to maintain a strategic distance from any harm to your skin. Expelling cabinet entryways might be useful also, contingent upon how adaptable you are, with regards on coming to inside to the most profound openings of your cabinets. As before, evacuating the equipment and washing it independently is a smart thought, in addition to you show signs of improvement access to the little areas of a cabinet that was underneath the equipment pulls and pivots. Wipe all the cabinet clean with a cloth dunked in your cleaning arrangement. Utilize an alternate clean cloth to dry the surface, once all the old gunk has been expelled. When everything is spotless and dry, supplant all the equipment, and put the kitchen cabinet entryways back on. Ideally, your cabinets look simply like new, and you've spared yourself a couple of thousand bucks in substitution costs. If you’re still not too enthusiastic about what they look like, at that point perhaps it's an ideal opportunity to consider a crisp layer of paint or varnish to light up things up. We repainted our dim old cabinets with a new coat of while melamine paint and new refreshed equipment. While we did, in the end, supplant them, the paint and new equipment made them endurable for a couple of more years.